Jamie Donaldson provides strategic integrated communications support, including public relations, social media solutions and online marketing to clients in a variety of industries from nonprofit to technology. Before landing the role of director at c21, Jamie was a senior account manager and an account manager at c21. An expert in digital communication, her work at c21 has won awards from the International Association of Business Communicators and the Public Relations Society of America. Previously, Jamie was a digital media intern at Georgia Aquarium, a nonprofit dedicated to inspiring aquatic awareness and conservation. There she managed the Aquarium’s social media pages, wrote blog posts, updated the website and tracked digital campaigns. Jamie also independently managed the online presence and blogger outreach initiatives for children’s animated book app startup Mighty Yeti Studios. 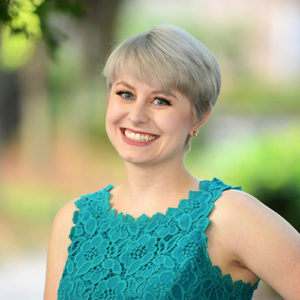 Jamie has a master’s degree in journalism and mass communication from The University of Georgia where she focused her studies on children’s media and public broadcasting. Before that, she received a Bachelor of Arts in Journalism with a major in telecommunication arts and a minor in anthropology from The University of Georgia. Outside of the office, Jamie is a dog mom, occasional style blogger, travel-lover and a bit of a geek. She has an expansive array of dresses and too many shades of nail polish to count. On the weekend, she enjoys reading, taking pictures, binge watching TV shows, playing video games and listening to Canadian alternative music. Jamie is always up to try new restaurants, hang out at a concert or explore local sites. She is also a former musical theatre kid and a Georgia Redcoat Marching Band alumni.